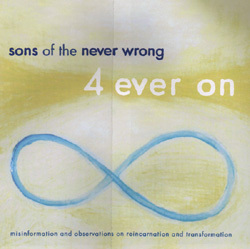 Sons of the Never Wrong"4 ever on"
Gadfly Records is proud to announce the release of "4 ever on," the fourth CD from quirky nouveau-folksters Sons of the Never Wrong. Growing from the foundation built with their first three releases, "4 ever on" shows the group's extension as it pushes the limits of its odd and offbeat music that is both groundbreaking yet somewhat familiar. Blending the best vocal elements of groups like the Mamas and the Papas and the Roches with a lyrical sophistication of Talking Heads, "the Sons" (Bruce Roper, Sue Demel, and Deborah Lader) are lively performers who hit their intricate harmonies as well on stage as in the studio. Based out of Chicago, they have already solidified a strong fanbase in their hometown, and they are poised, with this new release, to make waves on a national scale.